This page is out of date. It refers to the installation I had when I was living in the Adelaide Hills, South Australia. On 9 July 2007 I moved to Dereel, Victoria, but I haven't got round to updating the documentation. Watch this space. 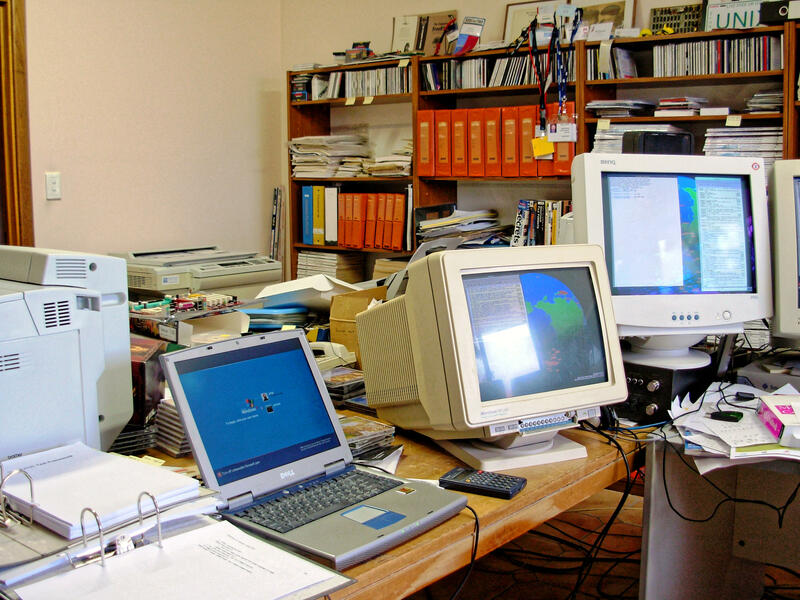 The photo on my home page shows me in my office in Echunga in front of four computers and an X terminal. It was taken in February 2002 in the new office in the house extension we built in 1999. This is about the last time that I could get a photo taken of me in front of my “desktop”. 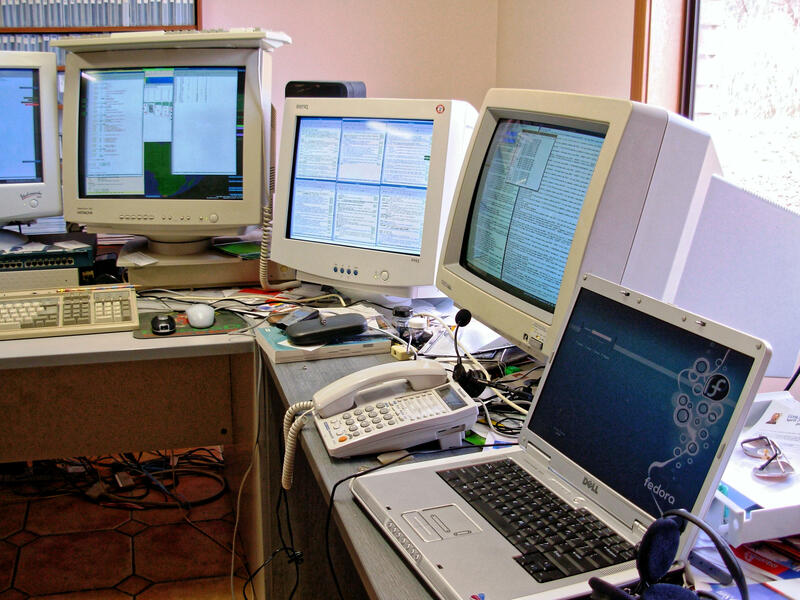 Since then, the amount of hardware has increased considerably, notably the number of monitors on the desk. This page describes the configuration as of 8 July 2006. 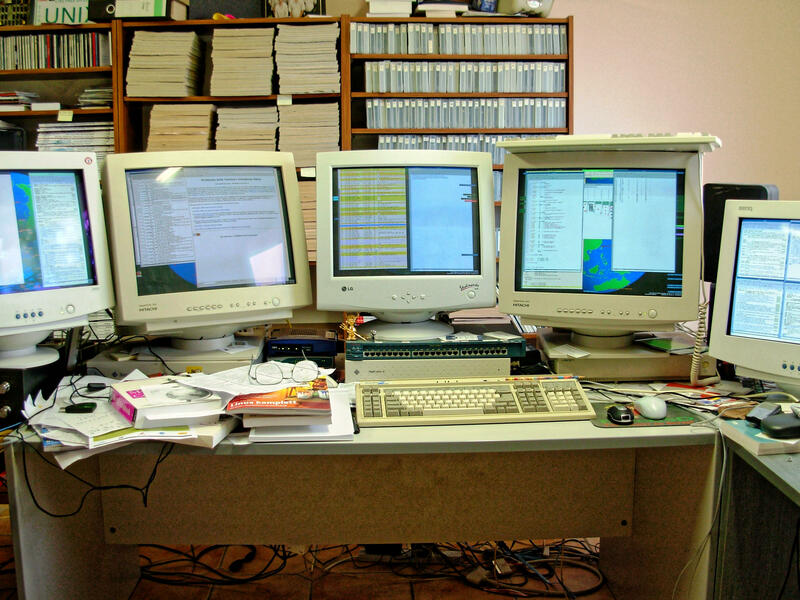 I have descriptions of older configurations dated September 1998 (two monitors), October 2000 (three monitors) and February 2002 (five monitors). This picture needs some explanation. In previous versions, the main machines were visible; now they're not. The laptop on the extreme left is pain.lemis.com, a Dell Inspiron 5150 running Microsoft “Windows” XT “Professional”. When at home, I use this machine only to access files that other people insist on sending me in Microsoft formats. Display size 1024x768x24, though when I access it it's usually from one of the other systems via rdesktop. This machine is dual boot with FreeBSD: when I travel, I run FreeBSD on it, since it has never given me any trouble with projectors. Behind the second and third and fourth monitors from the left is wantadilla.lemis.com, an AMD Athlon XP 1700+ with 1 GB RAM. This is my main work machine. It drives the leftmost four monitors. echunga.lemis.com is behind the second-rightmost monitor. It's an AMD Athlon XP 3200+ with 512 MB memory, running FreeBSD 6.1-STABLE. It's my main gateway to the Internet, running an IP-IP tunnel to connect the local network (192.109.197.0/24) to the outside world. It includes my main source disk which is NFS mounted across the network, and it also runs the rightmost three monitors. The machine on the extreme right is eucla.lemis.com, my work laptop, a Dell Inspiron 6100 running Fedora Core 5 Linux. It's also dual boot with FreeBSD, but most of the time it runs Linux. The display resolution is 1920x1200. Underneath the left-most monitor is flame.lemis.com, a SPARCStation 5 with OpenBSD 2.5. It used to be part of the Samba build farm. Underneath the next monitor to the right are iskra.lemis.com, a SPARCStation 2 which sometimes runs SunOS 4.1.3_U2 or Solaris 2.2, but which is mostly just a prop for the monitor, and a Cisco 2900XL switch. x-rated.lemis.com, a Labtam X terminal, is under the middle monitor. The box is the same size as the SPARCStations, so it props up the monitor. I can't remember when I last powered it on, nor where the firmware for download is located. wantadilla:0.3, running on an nVidia GeForce4 MX 4000 board with 64 MB memory, connected to a 17" ADI MicroScan 5AP and running at 1280x1024x24. Horizontal frequency is 64 kHz, vertical 60 Hz. wantadilla:0.2, running on an nVidia GeForce4 MX 4000 board with 64 MB memory, connected to a 19" BenQ P992 monitor and running at 1600x1200x24. Horizontal frequency is 93 kHz, vertical 75 Hz. wantadilla:0.0, running on an nVidia GeForce 6200 board with 128 MB memory, connected to a 21" Hitachi SuperScan 813 and running at 2048x1536x24. Horizontal frequency is 114 kHz, vertical 73 Hz. wantadilla:0.1, running on a Matrox MGA-2064WW board with 4 MB memory, connected to a 19" LC Studioworks 900B monitor and running at 1600x1200x24. Horizontal frequency is 95 kHz, vertical 76 Hz. echunga:0.0, running on an unidentified nVidia board with 64 MB memory, connected tp a 21" Hitachi SuperScan 813 and running at 1920x1440x24. Horizontal frequency is 115 kHz, vertical 77 Hz. This combination is very similar to that for wantadilla:0.0. I could run this monitor at 2048x1536 as well, but in practice I find that I can't find a good font that displays well at that resolution. I run wantadilla:0.0 that way anyway so that I can grumble at how many “clever” web sites render badly at this resolution, but more importantly to be able to display digital photos without reducing them in size too much. echunga:0.1, running on an SiS 315PRO board with 32 MB memory, connected to a 19" BenQ P992 monitor and running at 1600x1200x8. Horizontal frequency is 93 kHz, vertical 75 Hz. When I have to stop it, I'll reconfigure. echunga:0.2, running on an SiS 315PRO board with 32 MB memory, connected to a 20" Eizo Flexscan 9500 monitor and running at 1280x1024x24. Horizontal frequency is 78 kHz, vertical 73 Hz. This is the oldest piece of hardware I have. It was made in November 1989. The fact that it's still usable is a sad reminder of the failure of Moore's law when it comes to display resolution. Yes, it can only do 1280x1024, but show me a modern monitor (especially an LCD monitor) that can do 2560x2048. That's quite a bit more than the standard 768432 pixels of a “normal” display, of course—in fact, about 22 times as much. More interesting is the average display resolution of the X displays, 1843996 pixels. On a 4:3 display, this would correspond to 1568 x 1176 pixels. Here are the X configurations for wantadilla and echunga. The keyboard is a Northgate OmniKey/Plus. It was the best keyboard I ever had, but after 8 years of constant pounding it wore out. I briefly replaced it with an Avant Stellar, made by a company who has now also gone under, but wasn't quite the same, and it had some issues with the CapsLock key turning on by itself which made it very difficult to use with x2x, so I had to go back to the OmniKey. I've since found two “new” OmniKey Plus keyboards, so things aren't quite as bad, but I suppose I'll need further replacements unless some company starts building well laid-out keyboards again. If you know where I can get a new OmniKey/Plus, please contact me. Adjoining my office I have a lab room, for historical reasons called the Mike Smith Memorial Room. The most recent description of its contents dates from February 2002; I'm working on an update. A satellite Internet downlink; the provider has since stopped the service, and I have been able to get an ADSL service, so I would have changed anyway. A FreeBSD-based wireless access point. This machine is now running the fermentation temperature control, and I've installed a couple of semi-proprietary wireless access points (they run Linux, badly, but they don't supply the source).